adding information covering the 100 and 500 series in due course. Further down the page you will find Stop Solenoids and Electric Shutoffs. Please call us with the numbers found on your solenoid and use the reference number shown below for the style mounting you require. You can also request information by e-mail by clicking on the links below each item. E.S.O. units shown below are three commonly used E.S.O. 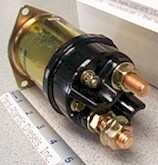 solenoids for CAV or BOSH Rotary Injection Pumps. These are not polarity sensitive but are voltage sensitive. Must be energized to run. TECH MINDER You can not bleed the injector pump without energizing this solenoid. It stops the flow of fuel to the pump.